Apollo Astronaut: Climate Alarmism Is the ‘Biggest Fraud in the Field of Science’ | Watts Up With That? Apollo 7 Astronaut Walter Cunningham has described climate alarmism as fraud, while presenting a preview of his upcoming Heartland presentation scheduled July 7-9 to MRCTV. Cunningham blames the media for climate hype. Cunningham ends with a scathing attack on the current state of scientific inquiry. July 6, 2014 in Alarmism. Probably more accurate to say they don’t take the time and trouble to find out because then they would find it harder to deny to themselves that they were intentionally misleading the public. Wilful ignorance, in other words. So true! Climate science is not rocket science – it is BS for Geography types – those people with coloring crayons who incapable of logical scientific enquiry and deduction. While I have little doubt that Col. Cunningham’s opinion is based on well-researched evidence, we need to be careful not to rely on the “argument from authority” trick. Whether it’s Al Gore or Walt Cunningham, I’m under no obligation to accept anything as fact just based on who the speaker is. Nullius In Verba. Climate Alarmism = Massive infarct of the peer-review system. And therein lies one of the main problems. Most people, including the MSM folks, simply won’t look far enough into it to discover that the main claims and conclusions of the alarmists are incorrect. The old guys get it right — Col. Cunningham is dead on and no one can question his credentials. Thanks Col. for speaking out! from an old infantry Captain. The media IS intentionally misleading the public. There can be no other conclusion drawn since the actual evidence is so strongly against the claims of the fraudsters. It is not laziness. It is a concerted effort by the same political leaning as the governmental agencies that put forth the AGW propaganda. I would agree with you if Cunningham said “It’s a fraud because I said so.” However, he’s never said that. He lays out his arguments against “climate whatever” as a good scientist should. In contrast, others use a bully pulpit to wave the “climate whatever” flag. Cunningham earned his credentials by research. He’s always supported his positions with the facts as he sees them. Agree or disagree with his argument, but before pulling the trigger, make sure you’ve paid the price for the ammunition. If I need to put it more simply – a cheap shot…;. Mods, this may go into moderation – That’s OK, thanks for your hard work. No you don’t because the speaker is merely another scientist telling you to take the time and trouble to find out about the alarmist claims and just like he has, you’ll easily conclude it’s nonsense too. I’ll call your “argument from authority” and raise you a “strawman argument.” Nobody’s saying that you are obligated. Obama pays to continue this fraud with taxpayer monies. Kerry, Clinton, the EPA and NASA are his trench warriors. Follow the money..skeptics make $0 while alarmists and so called “green” energy scams are making millions. I looked into this “debate” for myself, it took all of 20minutes to know the truth. Slowly but surly the Great Scam & Scheme unwinds itself. From a logical standpoint, the ‘argument from authority’ is obviously fallacious, but ‘authority’ is standard operating procedure from the media standpoint. A thousand witnesses could report seeing the exact same thing, but the media will then turn to ‘an official’ to get the ‘real’ story. This happens everyday, and it doesn’t seem to matter how completely stupid the ‘official’ story is. The media, being generally stupid themselves, will accept it over the words of a thousand different eye witnesses every time. The quintessential example of this is the downing of TWA-800. A thousand witnesses saw a missile rise up and strike the aircraft. The ‘official’ story does not fit any of the facts and is physically impossible, but the media dutifully reported it as an accidental central fuel tank explosion. The official story will trump the facts every time, unless the media doesn’t like the official. Only then will the media begin to question the facts. That is why climategate was far more damaging to the warmest’s cause than any climate records could be, because some in the media started to dislike and distrust some of the warmests. In the case of global warming and the media, it is much more important for the warmests to be ‘official’ and ‘authoritative’ than to be scientifically accurate. Of course, it doesn’t hurt to have a superlative-laden story. Superlatives are the drug of choice for the media. They cannot get enough of “the worst, hottest, coldest, most damaging, most destructive, most dangerous, biggest catastrophe, greatest threat, largest disaster, worst drought, flood, wind, rain, heat wave, snowstorm, extinction and so on. While we skeptics may have all the facts on our side, we have very little authority and few superlatives. That is why stories like this one are so important. Here we have an Apollo astronaut using a superlative AGAINST the warmests. This story could get more traction in the MSM than 15 years without any warming, even though an astronaut (who didn’t even land on the moon) does not have as much authority as say the Academy of (obtaining grant money in the guise of) Science. All of our lovely facts are wonderful for sitting in our little corners and feeling confident that we are right, but if we want to get our story out through the media, we will need to acquire a lot more authority, a lot more superlatives, and/or get the media to personally dislike those pushing the warming agenda. In other words, if we want the media to be on our side, we have to give them all the things our opponents have been giving them since day one! In the media battle, our biggest weakness is the belief that ‘facts’ are the most important thing to the media. That is just not true. The media gives lip service to the facts and would like us to believe that they care about them, but the evidence is overwhelming that ‘the facts’ are way down on the list of required ingredients for a good news story. The media will not look at the facts and conclude that the warmests are dishonorable charlatans. They must first come to the conclusion that they are dishonorable charlatans and only then will they begin to look at the facts. Having an APOLLO ASTRONAUT proclaim that Climate Alarmism is the BIGGEST fraud in the field of science is just ‘one small step’ in winning the media battle. Eustace.. what should we rely on? Climategate, a .8degree c. rise in temps over 100years? Temp records adjustments? M mann’s hockey stick? Al gore and his propaganda machine(ie climate corps whose speakers make money from wind farms?) Climate models that do not have clouds ? 97% consensus baloney? Ipcc political agenda? Rise in co2 follows rise in temps. Tell me where I’m wrong. I prefer “Before pulling the trigger, make sure you know which direction the gun is pointed in.” This is the conclusion of an anecdotal story told by a colleague of mine. We need more well known people to come public with this to counter the 97% nonsense. Is climate alarmism deceptive? Let’s take a look at the evidence. Prior to the publication of AR5, the climate models were non-falsifiable; thus, global warming climatology was necessarily unscientific. In claiming global warming climatology to be a scientific enterprise, climatologists were erected a pseudoscience. The models were non-falsifiable because the climatological community had failed to identify the events underlying the models. A model is falsified if and only if the predicted relative frequencies of the outcomes of events are compared to the observed relative frequencies and there is not a match. In the absence of identification of the underlying events, there was, for global warming climatology, no such thing as a frequency or relative frequency. The authors of Chapter 11 stop short of telling us whether the specified model is falsified or validated by the evidence and fail to provide us with sufficient data to determine this for themselves. Also, it appears that the focus of the study has been shifted from global temperatures to local temperatures for the purpose of improving the statistical significance of the conclusion. Thus, it seems to me that in the wake of publication of AR5 we continue to lack a scientific basis for control of the global temperature, contrary to the impression that is left by the alarmists. Please change the phrase “were erected” to the phrase “erected” in my previous post. Have him use Jame’s graph in his presentation…..
. . . Having an APOLLO ASTRONAUT proclaim that Climate Alarmism is the BIGGEST fraud in the field of science is just ‘one small step’ in winning the media battle. . . .We need more well known people to come public with this to counter the 97% nonsense. Yes, it’s long past time for an “Enough of This Climate Nonsense” movement, led by people the media simply cannot ignore. Scientists, movie stars, politicians, whoever—and a major party presidential candidate who will stand up and denounce the outright fraud that has been perpetrated on the American people for the last three decades. It’s not enough for political figures to quibble about the effect on the economy of the insane ‘climate’ policies of the Administration. They have to denounce the fake ‘science’ behind those policies, and to do that they will need this movement. There has to be a critical mass of folks who are willing, like Walter Cunningham, to speak out, and brave the storm of ‘official’ reaction. My teenager almost always considers me wrong. Does that make my teenager a scientist? No. “It is hard to fill a cup that is already full” is closer to an accurate description about learning science. Does your cup have room for more? That’s a good start. Do you want to add more knowledge? Even better. Does the professor know things you don’t? Probably. Might the professor be mistaken or his/her knowledge incomplete? Yes, but yours is even more mistaken and incomplete. I had a photography teacher in high school. I was sure I could make photos as well as he. Rather than merely arguing about it he challenged me to a bet (loser buys giant ice cream cones). Target: License plate at 100 yards (far end of the football field). I was shooting 35mm high contrast copy film, very high resolution, infinite resolution in my mind. He was shooting 4×5 inch with a 135mm lens on a Crown Graphic, not sure what film, probably Tri-x. The outcome was predictable by him — easily read the license plate, my photo could barely tell there was a license plate. You see, he knew the physical properties of light; I did not. Cheap shot? Moderation? Are you kidding? Good grief. The Warmists trot out innumerable high-profile airheaded celebrities and politicians to spout the CAGW propaganda. Of course Col. Cunningham is more grounded and reasoned than them. But the fact that it’s him doesn’t make what he’s saying more true or less true. What’s wrong with that, may I ask? Walter does have a solid CV. You could do worse relying on him as an authority. He’s and astronaut; up there with Medal of Honor in the public’s eye. Some will listen and hear him out. Walter Cunningham isn’t the only astronaut who is a “denier”. The last one to walk on the moon is also a “denier”. Obama said deniers think the moon is made of cheese. 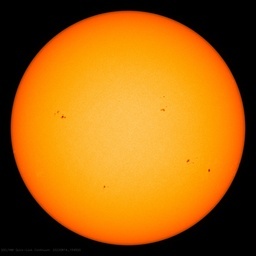 See http://appinsys.com/GlobalWarming/ObamasCheese.htm for details — in 2012 49 NASA scientists (including 11 astronauts) signed a letter disputing AGW. i see nothing out of line with your remark because, obviously, it’s not the content that’s interesting- we all know it and have heard it forever. what is interesting is Who is saying it- obviously not to be dismissed as a flat-earther or moon-landing-hoax person. but, eustace, any forum, when it’s been around for a long enough time, develops a memeplex and a catechism. so i don’t’ think you needed any correction or any grief. if a person can parse cunningham’s ungrammatical speech, he should be able to get your point. As said follow the money. One needs to know nothing of the stated cause and effect, the money flows reveal enough. Force of government is being employed to take money from the many, harming the poor most. To the exclusive benefit of the well connected few. With zero benefit to the claimed victim, our environment. At closer examination there are negative effects on the environment caused by the CAGW scam. As an impoverished public seek cheaper/affordable means of lighting and heating their homes. So when do we start prosecuting the fools and bandits who have created and perpetuated this global FRAUD? Absolutely correct. Having authority does not make ones statements ‘truer’, but it does make them far more ‘newsworthy’, and newsworthy things have the perception of being true to the general public. Warmests have ignored the truth about climate change, but complete embrace the reality of media and public relations. We skeptics completely embrace the truth about climate change but have ignored the reality of media and public relations. In the long run, the truth always wins, but that can take thousands of years. In the short term, authority, even when wrong, usually wins the day, especially if the ‘truth’ is somewhat complicated (like climate change science). We have ignored this reality at our own peril. Fortunately, ‘authority’ is an extremely subjective concept, and can often be created by simply declaring it with authority. All those attending the conference in Las Vegas this week should subtly refer to each other as world-leading authorities on their given subjects. And every report should be referred to as ground breaking, unprecedented and state of the art, to build up the perception of gravitas among those who might be watching. The warmests do this very thing because they are realistic about the media, even though they cannot be realistic about the climate. We can be realistic (logical) about both the climate and the media, and win the day much sooner than if we continue to ignore the reality of how media works. Well said, Jim Clarke. Unfortunately the media will run all stories through their warmist filter as they torpedo the skeptic message. Only this morning listening to NPR, half awake, I heard someone claiming penguins are in big trouble like polar bears and it’s our fault…huh? Hasn’t that already been discredited? Not in their minds. I mean it could happen and it would be horrible. Of course. What’s good about his public contrarianism is that he can’t be dismissed as a crank or a crook, that, he will easily outweigh the warmist endorsement of less credible figures like Paulson and Bloomberg in the court of public opinion, and that he might embolden others. Also, that he will attract some press attention to the upcoming ICCC (which should be renamed the CCCC, with the first word being Contrarian). You, sir, are well named. But if Forrest Gore had the quote, that’s cool? But he is a scientists and well educated and accomplished in the process of science. He has the tools to actually understand the arguments and evidence around climate change, and make an educated decision. Al Gore is not a scientist, and he barely passed when a few teachers tried to educate him in the process of science. Al Gore is the perfect example of using of the power of authority and media savvy to persuade the masses in the absence of knowledge an truth. You, sir, are the perfect example of how effective that is. The MSM are not intentionally misleading the public. They truly believe the narrative, because it fits entirely within their anti-capitalist, pro-socialist, “some people are bad so we must control all people, and you should do what I say because I am smarter than you and know what’s best for you” world view. It is the intersection of confirmation bias, argument by authority, availability bias, and a few other logical fallacies. Also, there is an ounce to truth in the theory (yes GSG warms the planet, the question is by how much, and is it necessarily bad), so it’s easy for them to believe all the lies that go along with the small truths. They are so invested in this belief that they honestly believe that we are the ones intentionally misleading the public. It’s a pretty sad state of affairs. In the Obama era truth is irrelevant. Facts are irrelevant. I wouldn’t say they are irrelevant, but there is at least a considerable ‘lag’ in relevance. You’re not looking at the big picture. JIm Clark says it very well above. We need people with heft and a positive public profile giving voice to the skeptical side of the argument. Of course no one expects you…or anyone…to simply take one individual’s word on a wickedly complex issue. What we’re looking for is media coverage, and the increased credibility that hopefully comes with that. Our MSM should be shut down. What a bunch of liars. …and the money is relevant. Spend the future into oblivian…which is irrelevant. (A) Michael Griffin, the former head of NASA before its official mission became to literally help make non-Space faring Muslim counties feel proud about their early science achievements a thousand years ago, all so criticized climate alarm. “The following letter asking the agency to move away from climate models and to limit its stance to what can be empirically proven, was sent by 49 former NASA scientists and astronauts. Col. Cunningham, as has been pointed out earlier, said check the data out yourself. This is not an argument from authority, but an invitation to disengage from popular narrative and find out for ourselves what is happening. How often do you hear the MSM make an invitation like this, specifically concerning AGW, without some type of pre-qualification, or confirmation bias? I myself was pretty busy with a career to concern myself this issue until about 12 years ago when for professional reasons I had to review 14C calibration methods. Suffice it to say that since then I have been following the data, not the clowns. The education, training & experience of skeptical astronauts, NASA mission controllers, rocket scientists & aviation engineers like Burt Rutan make them far more qualified to evaluate “climate science” than Prince Albert. Lou regarding your off-topic link to the EPA raising allowable radiation limits…. I used to work in a nuclear facility. I took a radiation meter to Banff, Alberta, and recorded higher radiation levels in the center of town than were legally allowed in my workplace. Wtf??? The left are unreasonably afraid of radiation, erroneously believing that there is NO acceptable level of radioactivity. That flawed and dangerous attitude needs to change or more countries will be setting themselves up for nuclear-free disasters. I mean really, he’s showing his total lack of understanding of the role of CO2 in the atmosphere. And his claim that CO2 was much higher 500-600 million years ago. Back then high levels of CO2 brought the Earth out of a snowball and then there were no glaciers and the oceans rose rapidly and there was mass extinction events and oxygen levels fell dramatically in the oceans, leading to hypoxia. Alarming stuff hey! I can’t believe you guys are saying the name Al Gore and you’re both considering it an argument from authority. “Biggest fraud in the field of science”, definitely a Marine colonel, he doesn’t mince words. The opening panic scene is priceless. CACA is a crock, plain & simple. What has happened, and continues to, is that the weather is being hyped by the MSM. Any kind of bad weather now is a commodity. It’s in our faces 24/7, a continual barrage. It is what used to be called “yellow journalism”, and the MSM now practice it shamelessly. Additionally, there is always the connection, either direct or implied, is that things are getting worse due to “manmade climate change”. It’s total nonsense, of course, but the sheeple and those too stupid to think for themselves buy into it. Mr. Crunch in the end you will have to take the word of somebody. However much you look and read, unless you study a particular branch of fundamental phisics you will not follow the explanation surrounding the radiative behaviour of CO2. Most of what you read on these blogs is simplistic regurgitation of Wikipedia. But if you insist on looking. Study the fundamental working of the CO2 laser if only to understand how the atmospheric CO2 is not like it. Like Col. Cunningham, after researching it and running a lot of numbers myself, I came to the same conclusion — a “no-brainer” — the CAGW evidence a house of cards (made of tissue paper). FWIW, I too am a retired NASA scientist. During my career, I found that most Scientists (including my colleagues at NASA — and me too when I was very young) were often blind to (or rationalized) any fact that contradicted the tenets of their specialty — particularly if it put their specialty or favorite hypothesis “at risk”. So, don’t expect the more “invested” Climate Scientists to suddenly “see the light” — even if its a “no-brainer”. Those were the glorious days of NASA when astronauts went to the moon in less than a decade of preparation. When real scientists and engineers ran NASA. 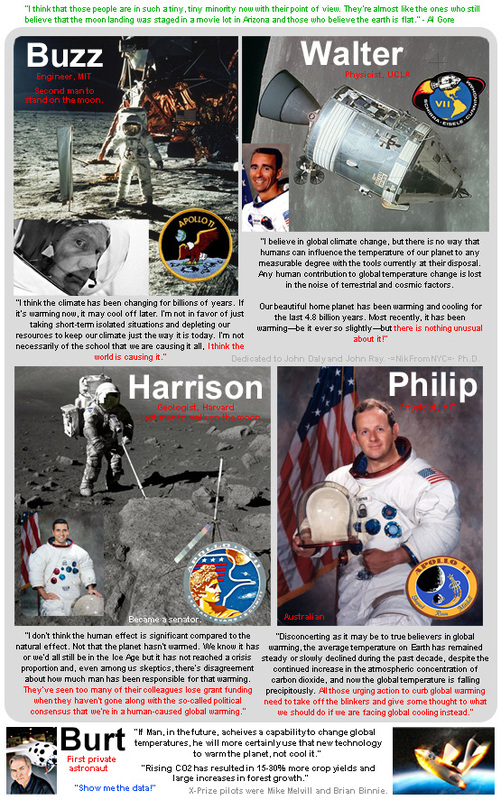 The likes of Hansen is an insult to the intelligence of former NASA personnel. …so the guys and gals behind the Mars Exploration Rovers aren’t real scientists? That is amusing, Marsrover was launched in 2003 so that would, allowing for research, design, procurement and testing, put its inception somewhere in the late 1980’s … and probably before the “project management” team were out of college. JPL is okay. Unlike in 1960s GISS is no longer doing science under Hansen. He’s being way to generous with regard to the media. First, it’s what they want to believe. Second, it’s what’s coming from their side, so they have no interest in questioning it. Considerably less than 97% of Apollo astronauts believe in this nonsense. One of our worst prime ministers, Gordon Brown, described sceptics as ‘flat-earthers’. So, according to him, some men who walked on the moon are flat-earthers. The ignorance of many believers like Brown, Obama and Ed Davey seems to be limitless. Yes, but who would you rather rely on, for trustworthy information … ? A mediocre and boastful politician, who is riding a popular band-wagon and has his hands firmly in the Climate till (cash register). An educated, successful, rational scientist and astronaut, who has nothing to gain and everything to lose, by standing up for what he thinks to be the truth. I know who i would trust the most. To the Media, there are only two stories of any importance: Good News and Bad (Bad is best). No problem; no story. Walt Cunningham is an Apollo astronaut and has Bachelors, Masters and Doctorate degrees in Physics. But that doesn’t make him right. It’s his scientific arguments which make him right. But his background gives him cred with the public. We can’t ignore the aspect of public relations as the fight against the AGW beast isn’t scientific, it’s political. Right you are, Sir Astronaut! Except it isn’t only the media and their “laziness”, it’s the media and their willing complicity. And it’s the progressives in both parties who want the total control that “climate change” mitigation policies would give them. Follow the money…and the power. You get to the source of the stink. One of my favorite absurdist leaps of logic is…Lewindowsky & company in a peer-reviewed paper find that AGW skeptics are nut cases who are highly inclined to believe conspiracy theories such as the moon landing being faked. In Mr. Cunningham’s statement and the letters sent to Congress signed by many of the Right Stuff scientists, engineers, & astronauts in recent years these individuals have shown themselves to be doubters…therefore they obviously think that they faked their accomplishments. Thank goodness that we have academics to point these things out to us great unwashed. So, if Eustace Cranch is correct (funny hat tip to Cordwainer Smith), there is no reason for anyone to say anything, because the truth value of what one says would not be determined by who one is? When you try and link the news page on this article to FB it won’t play but directs you to some weird smash a duck app – censorship at its finest or just a stuff up? He says, “The media are largely to blame for public misconceptions – not because they’re intentionally misleading the public, but” Except for one thing. They really are intentionally trying to mislead the public. It is so obvious. That is why they never report any of Obama or the Democratic party’s wrong doings, which have been too numerous to count and getting more outrageous as time goes by. That is why they only hire reporters with extreme liberal points of view. Lets tell it like it is and stop covering for CBS, ABC, NBC, MSNBC, Huffington Post, Washington times, New York times and the LA Times. These are all just propaganda blogs for the progressive-communist agenda.